One of the most sought after 12oz beers of the past year, Prairie Artisan Ales Bomb! is another in the increasingly popular style of spicy stouts mixed with the already popular, and well covered by us, coffee beer. Can an Oklahoma brewer take on this complex blend of flavors? Kickstarter, that micro finance wonder-boy that promises to bring back 80’s childhood favorite Reading Rainbow, has helped raise funds for one of the most talked about breweries in America. Prairie Artisan Ales began with gypsy brewers the Haley brothers getting backing from distributing powerhouse and one time podcasters, Shelton Brothers. With a good web presence, and an awareness of beer geek trends like unique glassware, the Haleys raised more than double the $10,000 they sought, and were off and running. Starting with saisons, Prairie quickly began diversifying their lineup. Keeping their ear to the beer geek ground, Prairie quickly turned out a spicy imperial stout, ‘ala Cocoa Mole, Hunahpu, Mexican Cake, Abraxas, ect. The difference being that Bomb! skips the cinnamon element from the more Mexican hot chocolate style brews and adds coffee. Bomb! is an imperial stout ‘aged on coffee, cacao nibs, vanilla, and chili peppers’. The coffee is an espresso blend from Oklahoma roaster Nordaggios. The peppers are ancho chilies. It is available in 12 ounce bottles within Prairie’s distribution region, where 13% ABV beers are permitted. Prairie Artisan Ales Bomb! is a dark brown pour with a significant head of micro-bubbles that dissipates in short time. Nose is filled with coffee, cola, chocolate, chilies and alcohol. The carbonation is impressive in this 13% ABV stout, leading to a mouthfeel that is think and slick. Taste echoes that nose with even more coffee, which borders on overly bitter, sweet malts playing the counterpoint to espresso, and a vanilla element creating a delicious blend. The heat from the peppers is subtle enough to only slowly show itself after a few sips. Many spicy beers do well in small samplings, this one works throughout a much large tasting, even the full 12oz bottle. Finish is vanilla, coffee the chilies and booze. This beer is crazy good. As a fan of coffee beer I appreciate java being thrown in with the vanilla, peppers, and chocolate. 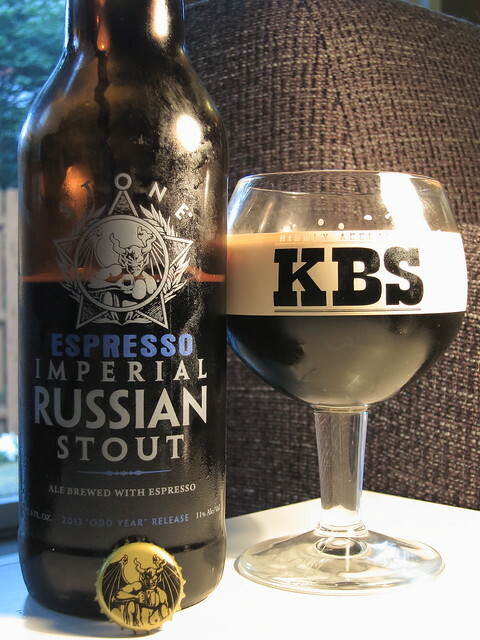 For those that do not drink coffee, the espresso roast might be a tad bitter, even if you like some coffee beers, but that is the only downside to what is an impressive stout. Craft beer review of Prairie Artisan Ales Bomb! Beer collaborations abound. One of the first American sour ales I loved was Marrón Acidifié—an imperial Oud Bruin—a collab from The Bruery and Cigar City. This beer was for me, a big success. Two up and coming craft brewers from different markets, coming together to make something that represented the sour program from The Bruery as well as the wood aging expertise of Cigar City. Now, with The Bruery coming together with 3 Floyds, brewers of many great hoppy beers like Alpha King, and Zombie Dust, as well as much sought after darker offerings like Moloko and of course the (in)famous Dark Lord. A pairing with the brewers of massive imperial stout Black Tuesday and its variants Mocha Wednesday, Chocolate Rain, and Grey Monday, could only bring a HUGE dark beer with bold adjuncts. 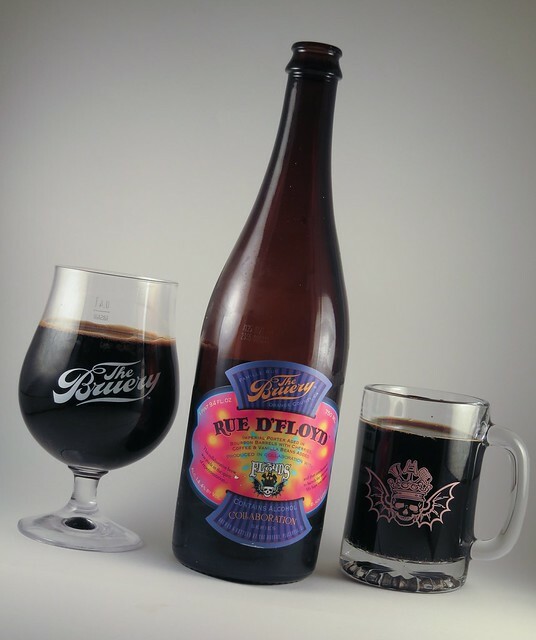 When it was announced that members of The Bruery’s Hoarders and Reserve societies would be able to buy both collaborations between these two craft beer titans, Rue D’Floyd and Floyd D’Rue, excitement was palpable. Perhaps not since Godzilla teamed up with Mogeura to fight SpaceGodzilla have such powerful forces combined for the cause of awesomeness. Then came the reality. These would be dark beers, imperial porters, and they would be trebuchet bombardments of flavor, each coming in over 14% ABV. Rue d’Floyd is aged on bourbon barrels for 1 year and finished “with vanilla beans, Portola coffee, TCHO cacao nibs and cherries prior to bottling”. Sounds amazing right? But then this sobering note: “Please consume by 6/30. This beer may contain Lactobacillus. Please keep refrigerated”. Yikes. These beers were brewed at The Bruery’s facilities, where recently infected bottles such as White Chocolate and Cacaonut have caused the Orange County company to issue the rare explanation of the problems and issued credits for beers that were sold with active, unintended microbes. This was in our opinion a stand-up thing to do. A practice not followed by all breweries that sell expensive, infected beer. They also seem to have stepped up quality assurance, testing the heck out of their beers for problems, not wanting to sell bad beer or deal with crediting angry customers. Testing for problems sounds good, but what to do when you have spent thousands on supplies and time, had another brewer fly out to collaborate at your facility, and invested a year barrel aging not one but two beers, both of which were promised to members of your pre-paid beer societies as exclusive to them. 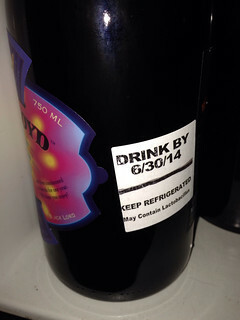 Lots of money was given to The Bruery in anticipation in part of the 3 Floyds collaborative bottle, and now they have found it is possibly infected with Lactobacillus, the bacteria that gives sauerkraut and Berliner Weisse their signature sour elements. Not an intended element for a chocolate, coffee based porter. So with all the investment put in to these beers, contrasted with all the investment put in quality assurance and building a brewery with a reputation for doing right by its customers, what does one do with a beer that might go bad? The solution they came up with to resolve the conflict between expectations and the bottom line on one hand, and reputation on the other: a ‘Drink By’ date. So the Hoarders and Preservation society members are left to decide if they want to buy something that may have a very short shelf life. By definition, hoarders would normally be all over this beer, cellering 5 for a later date or to trade. The disclosure limits those opportunities greatly. For some in the craft beer community, the assumption is that the beer already has turned sour. Is that the case or, one wonders, will it be a false positive? Will it be the white whale of beers people talk about for years but can’t access because sales were low and everyone drank them up immediately? Can lacto even live in a 14% ABV beer? Or is Rue D’Floyd really too big to fail? As stated earlier this is an imperial porter, weighing in with 14.4% ABV, aged on bourbon barrels for 1 year, then piling ‘roids on ‘roids Lance Armstrong style, added vanilla, coffee, cocoa nibs, and cherries. The pedigree is there, hopefully these two breweries who use roasted malts to brew much sought after stouts can do the same for porters. And there is that perky lacto problem, will it be a problem tasting the beer 3 weeks after its release, in early May of 2014? The nose, or scent of the beer is always the first thing we take note of, as it can inform a lot of what is coming, as well as alert us to potential problems. Thankfully, the aromas coming off Rue are nothing but delicious coffee, chocolates, vanilla, dark fruit and a hint of alcohol. Amazingly the oil black beer pours with a modest chocolate brown head, unusual for a beer of with such high alcohol content. Considering this aged a year on bourbon barrels, the solid, if fleeting carbonation is a welcome surprise. Tasting this thing brings huge flavors. Sweet bourbon flavors up front with subtle oak start off, followed by roasted coffee elements, a kick of vanilla and a hint of bitter coffee and booze in the sweet finish. As it warms even more oak comes forward, and the finish reveals the tart cherry flavors which meld with the other elements to make an amazingly delicious and complex brew. Just stunningly good. No trace of a lacto infection is present at this time to my palette. Loved this beer. Rue D’Floyd was consumed on May 2nd, 2014. Fresh, this beer is a perfectly complex blend of vanilla, coffee, chocolate and tart fruit nearly overwhelming yet highly drinkable. Quite simply, The Bruery 3 Floyds Rue d’Floyd is most delicious porter I have ever tasted. As a lover of stouts, I am happy to say that this big porter tastes better than even Black Tuesday, or Dark Lord. Obviously, the potential infection will keep most craft beer fans from tossing a bunch of these in the cellar. But that may be a good thing. Coffee and vanilla flavors are notorious for fading, meaning no matter if the infection is prevalent or not, Rue D’Floyd should probably be drunk up as close to bottling date as possible. And even if it does eventually take on some acidic notes, didn’t porters historically have a bit of a tartness, or a sour element? Starting in 2011 Stone began releasing reworked versions of both their barleywine, Old Guardian and imperial stout, IRS. I don’t recall 2011’s BELGO Old Guardian, but the Belgo Anise Imperial Russian Stout was not widely popular. Anise was a bold, but polarizing flavor. If the first odd year reception was look warm, would round two be any better? Packaging description: Like the classic version, this Odd Year edition was brewed in the authentic, historical style of an imperial Russian stout, but with the addition of several hundred pounds of espresso beans from our friends at Ryan Bros. Coffee. 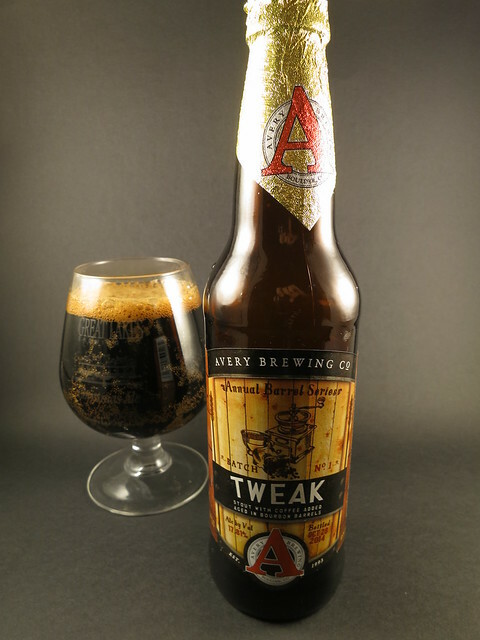 Layers of flavor and complexity augment an already enigmatic brew, leaving this darkly delicious libation positively brimming with deep, rich espresso flavors that meld beautifully with the roasty bitterness of the dark malts. 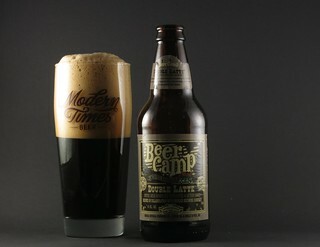 Lovers of coffee beer, we taste a favorite brewer’s take on a coffee stout with Stone Espresso Russian Imperial Stout. 2013 , another odd year brings two new odd beers: Stone Old Guardian Oak-Smoked, and Stone Espresso Russian Imperial Stout. For anyone who has even skimmed this site, you know what a passion we have for coffee beers. With a stellar brewery like Stone taking a shot at a coffee stout, there was no doubt a bottle or two would hit the cellar. Pours with a nice khaki head of bubbles of modest size. In bold contrast, the beer, like the original, Espresso IRA pours void black. The scents of well roasted coffee, chocolate, roasted malts, hops and dark fruits floods the senses with immediacy. With such an inviting nose, Stone Espresso Imperial Russian Stout has a lot to deliver. Thankfully, this stout brings it in spades. The taste unabashedly servers up coffee, vanilla, chocolate, subtly biting hops, and sweet malts. Big bold flavors are Stone’s calling card and this beer continues the tradition. The ABV is 11% but there is almost no hint of booze. A creamy and think body fits the style, coating the mouth with coffee goodness. Espresso IRS finishes with a nice dry, bitter note. Stone Espresso Imperial Russian Stout is a mouthful to pronounce, though if you get your hands on a bottle, one mouthful will not be enough. 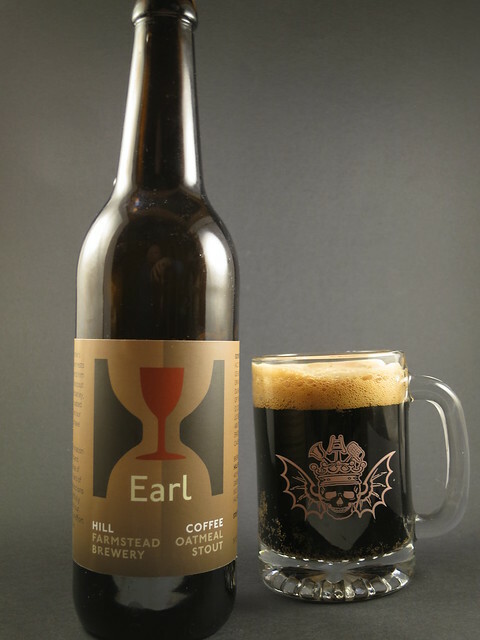 This imperial stout amplifies the natural roasted malt tanins of coffee and chocolate with the edition of Ryan Brothers espresso beans to make a magnificently sweet and bitter, dark beer. A huge coffee ale that delivers what it promises. Find a bomber of this odd year edition before it’s gone, and enjoy one of the best java and beer combinations around.